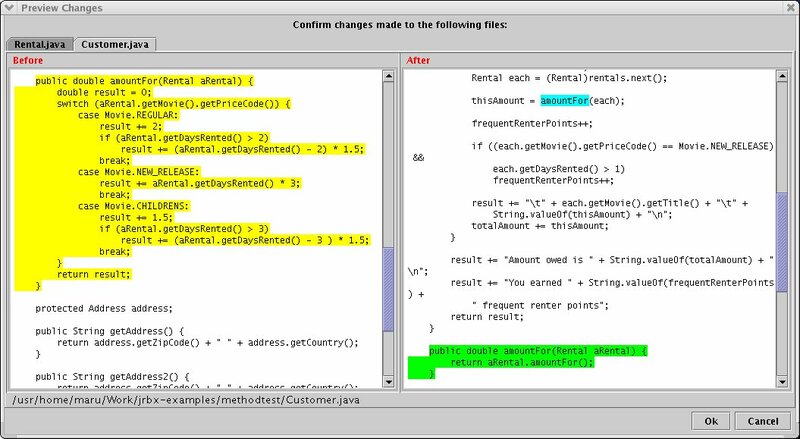 Jrbx follows an AST-based refactoing browser jrb using JavaCC. 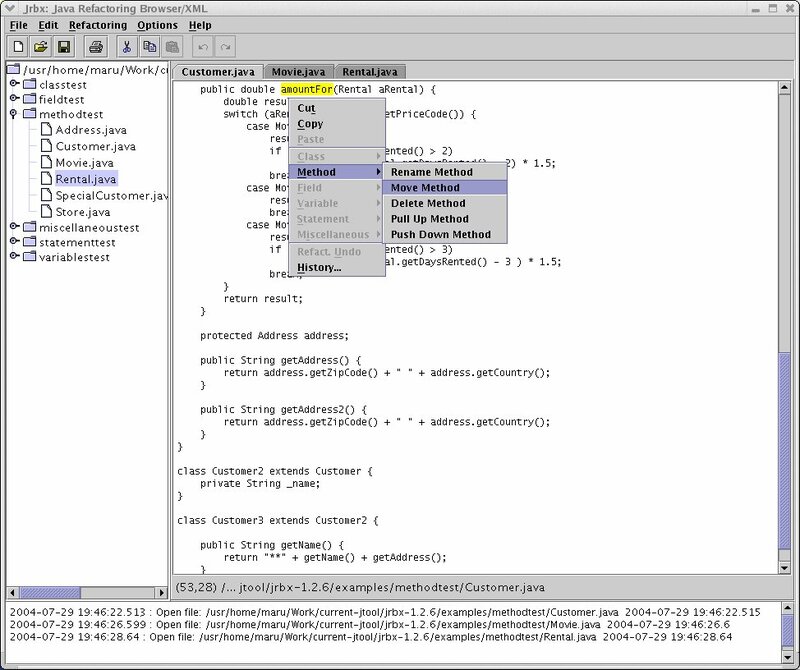 The development of Jrbx as an Eclipse plug-in is continuing. The latest version of Jrbx is available from here. The the jrbx-*-bin.zip file is a binary distribution and the jrbx-*-src.zip file is a source distribution. Confirm the installation of Sapid-5.285. Unzip the contents of the downloaded jrbxl-*-bin.zip file to some directory ($jrbxdir). You can find the jtool.jar and jrbx.jar in the $jrbxdir/lib directory. Unzip the contents of the downloaded jrbx-*-src.zip file to some directory ($jrbxdir). Change the current directory to $jrbxdir. or use jtool.jar packaged in the directory $jrbxdir/lib. You can find the jrbx.jar file in the $jrbxdir/lib directory. Execute "jrbx" in the $jrbx/bin directory. If it is the first run, input two directories ("Project Path" and "Sapid Path") to respective dialog windows. If you use Cygwin, input one additional directory ("Cygwin Path"). 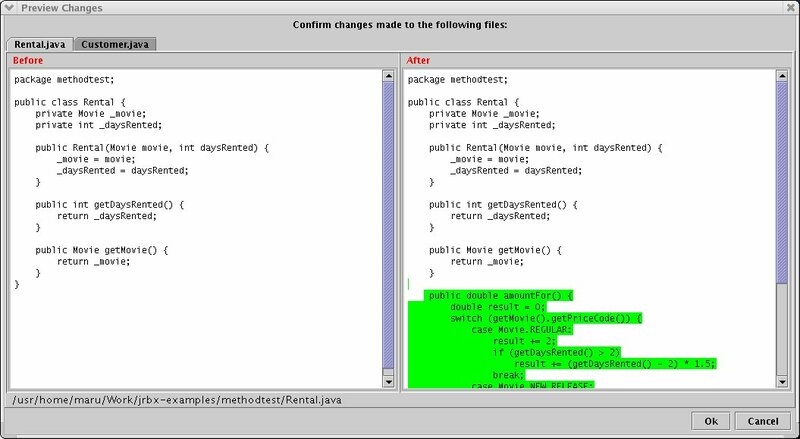 Otherwise, Jrbx loads the configuration file .properties.unix or .properties.windows in the directory where Jrbx is launched. NOTE: Execute "chmod +x *" before running the jrbx because file permissions are not stored in the zipfile resulting from the Ant zip task. NOTE: Modify the settings of the CLASSPATH environment variable to the directory where you installed Xerces and BCEL. You can make past refactorings affecting several files undone without a conflict between the files and consecutively. You can view all past refactorings through several filters. Copyright © 2003-2004 The Java-XML Tools Project. All rights reserved.